Perhaps no other industry must be more flexible than catering. Companies must have the inventory and quantities on hand to handle just about any kind of special event. The sales and service representatives for Republic Master Chefs have experience with the most demanding of catered events, and are in a position to ensure you have the right textiles on hand for whatever business comes your way. You’ll never know what you’ll need for your next catering job, so make sure you always show up with the best linens possible with our line of high-quality linens. We have a variety of colors, designs, sizes and materials to match whatever your catering project calls for. Whether you need tablecloths for a nature-inspired wedding reception or napkins for a high-profile charity event, Republic Master Chefs can meet your needs with superior high-quality products and laundering services. When you’re in the catering business, you’re dealing with a lot of pressure. 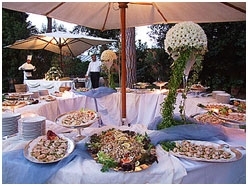 Often, catering services are only used for very important events like weddings and banquets. So, it’s essential to provide your customers with a truly amazing catering experience, from the appetizers to the linens. Every event is different, which makes the catering business so unpredictable. You can never really know for sure what you’re going to need until you book the event, but you also need a steady supply of clean table linens, aprons, uniforms and even kitchen towels so that you can handle any job. Republic Master Chefs is a reliable provider of high-quality linens that you can trust to get you everything that you need, when you need it. We’ve been serving the area for almost a century, and we understand your specific requirements.